10 YEAR LIFE EXPECTANCY, COMPLIANT TO ANSI/ESD SPECIFICATIONS! WHY ESD CONDUCTIVE FLOOR PAINT? Today's reality dictates an increasingly daunting task. To meet the latest ANSI ESD static control standards and assure your successful manufacturing of static sensitive electronics esd flooring is a must! Yet does it make since to pay $7.00 to 10.00 per installed square foot for esd tiles, thick set esd epoxy or an anti-static rubber flooring? Most think NOT. ElectraGuard is a true TWO part Epoxy that provides permanent protection against electrostatic discharge. It ALWAYS passes the latest ANSI ESD S20.20-2014 TR-53 standards! Economical yet long lasting, 10 year life expectancy! Meets latest specifications for electrical conductivity! Extremely low tribo generation, perfect for Class Zero ESD! Handles fork lift and heavy loads with ease! Eighteen Year track record! Proven performance! Wear performance that rivals esd tiles at 1/3 the cost! Anti-Slip, Made in the USA and Fast Application! Easy to maintain, lifetime conductivity! 24/7 live tech support available at no charge with each order! Inbound freight cost less than 1/4 compared to other flooring materials. Perfect for electronic assembly, manufacturing, munitions, air craft hangars, server rooms and more! Millions of square feet installed world wide! 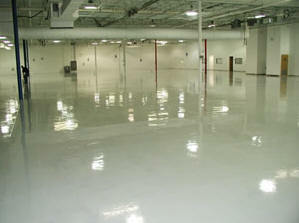 MORE INFORMATION ON ELECTRAGUARD ESD EPOXY FLOOR PAINT! ElectraGuard ESD Flooring has been successfully used by Major Companies for over 16 years and meets the newest standards of ANSI/ESD S20.20-2014 with a charge generation (per 97.2) of <10 volts! The basic ElectraGuard System consist of 3 coats of the epoxy applied with a 3/8 nap paint roller (a coat a day for 3 days) followed sealing with 2 thin coats of ElectraThane and a single sacrificial coating of ElectraGlaze (the sealers are applied with a mop and can be applied all in the same day). ElectraGuard can be installed by any competent painting contractor, by the end user or by United Installation Services.